An online journal of my musings, training ideas, and races. Loved my Hoka Gaviotas - but I think they are best suited for shorter runs. They don't really protect my knees enough. Will run in my Elevons next Saturday and on marathon day. Decided to stick to the full marathon distance - I'm trained for it. I need to run with an attitude of gratitude. I haven't blogged in a year! Ha! I had written a year ago (actually almost two years ago) that I was going to use this blog as a way to track workouts, races and nutrition. Well - I am finally going to do that especially since I have had an up and down summer/fall in terms of workouts. It's been really hot and I have struggled with nutrition and hydration. Today was a different, happy story. It finally feels like fall in Richmond. It was about 45 degrees and breezy when I started my run this morning. I have decided to run the Richmond half instead of the full marathon. I just don't have any interest in running the full marathon right now - maybe some other year. Anyway, I rode my bike for an hour prior to my 10 mile run. I felt rested and healthy - unlike yesterday (super tired, upset tummy and pink eye....the joys of teaching). I had a great run - felt energized and strong (for me - so it's all relative). Last Saturday, I made a dumb decision (not my first). After the Gasparilla Challenge, I should've taken it easy and run (at most) 6 easy miles. Instead, I opted to do the 12 mile loop with the City Stadium runners. I will say that I had a lot of fun meeting a new group of runners! However, about half way through the run (at the 6 mile point....should've stopped!! ), I felt a sudden tightness in my left hip. This was a new tightness and came on quite suddenly. Logically, I ran 6 more uncomfortable miles. DUMB. After the run, I could barely hobble around. I realized my hip flexor and glute were very angry with me, so I have become best buddies with ice and the foam roller. I've actually taken my foam rolling to a whole new level of pain with the introduction of the small, hard rubber ball. This can really get at the tight muscles more aggressively than the roller - and has helped them loosen noticeably loosen up. I've also gone to Barre class every day this week. The exercises in Barre are exactly what I need. They target all the areas of my body that running doesn't (particularly the hips, glutes and core). While the classes are super hard, I kinda love them. They are really challenging me, but I know I need it. I'm also going to get a deep tissue massage tomorrow. Hopefully, all of these things together will get me back to running quickly. It has been so long (as in years) since I've blogged. I'm going to keep this simple and use it as way to track workouts and races. Currently, I'm really into running (of course), spinning and barre classes. I know that I should swim, but I'm just not feeling it right now. 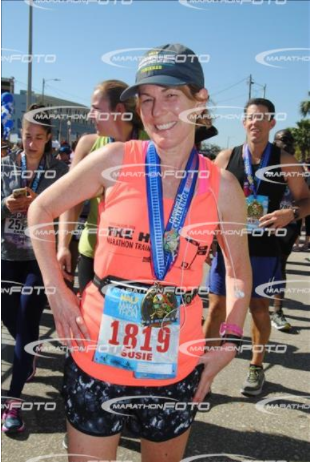 Anyway, my latest running adventure involved the Gasparilla Ultra Distance Challenge in Tampa Bay, Florida. It's quite a big running festival with something like 30,000 runners total taking part in one of the four races. We decided to go for it and do all four races. We ran the 15K and 5K on Saturday and the half marathon and the 8K on Sunday. 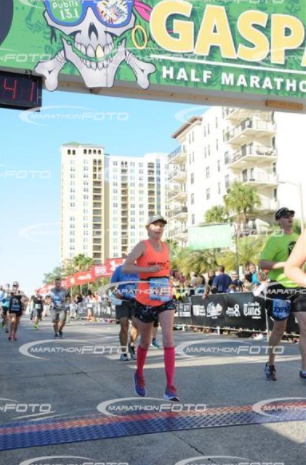 The courses all finish on Bayshore Drive - which is gorgeous! Next adventure: the Shamrock Dolphin Challenge in 2 weeks. *The running program at my elementary school in Concord, NH - we had four different choices for running routes. We did our runs (or walks) right before recess. What an amazing (and forward-thinking) school. We also had healthy snacks available to buy (fresh popcorn, apple slices, or peanut butter on whole wheat bread). *Running with friends - especially Suzanne, Manda, Joan & Erin. I wish I could back in time for just one more Saturday run with them. (Okay - I just burst into tears). *Running a variety of 5Ks in Richmond - I was stunned when I came in third in my age group in my first one. Where did that come from? Over time, I was able to throw down a few sub 21:00 minute 5Ks. It's hard to imagine running a 6:45 pace nowadays, but I had it in me when I was in my 30s. *Running with Collegiate's cross-country team (for 7 years) - lots of hard runs, lots of great kids.Those kids certainly helped lower my 5K time. Try running with high school kids! They are speedy. *Meeting Rick - we would talk between our half-mile repeats on Saturday mornings. I tried my best to keep up with that guy so I could talk to him a bit between intervals. After one of those workouts, I had coffee with Suzanne, Manda & Erin. I confided in them that I liked "this guy named Rick." *Running the Boston marathon - my favorite road race ever. Qualifying for it was rough (I was running on very, very tired legs), but the actual race was magical. *Early morning runs in the dark and cold - some might think them lonely, but I found them peaceful. *And every run in between. I used to be so sad when I thought of saying good-bye to running. I denied it and tried to outwit my body with knee injections and knee braces. Silly me. With time comes a more sensible attitude. 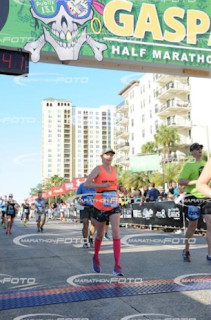 I am grateful that I had so many amazing experiences and memories associated with running. It's time for me to apply that same attitude towards other activities. I had another blog post up for about 10 hours until I came to my senses and deleted it. I realized when re-reading it (always reread what you've written - I know, I am full of nuggets of wisdom) that I was doing too much whining. I'm trying to minimize my whining these days, so that post had to go. On a happy note, I have rejoined the Peluso Open Water crew. After IMFL, my motivation to get in the pool waned to the point of non-existence. I figured I needed a break so I took most of the winter off from swimming - with an occasional short flail-around session every once in awhile. Well...I'm back. And I am out of swimming shape. But, I've got to start somewhere. I have actually looked forward to these workouts this week (sort of) because I know that a) they will be worth my time b) I'll see all kinds of people I like. In just two sessions, Laure has addressed some major technique flaws of mine with her various drills and pep talks. I'm also trying to get back to strength training (in addition to yoga). My arms and core are really feeling it today after strength training last night and swimming (with all kinds of push ups and sprints) this morning. It's a "good" soreness, though. One night (while procrastinating), I stumbled across what is now my favorite blog. The author (who happens to be a Vermont girl and Middlebury grad, so you know she's awesome) is a down-to-earth little speedster. Her blog makes me laugh. Check it out here - I think you'll love it. Anyway, I find myself minimally focused on triathlons and far more interested in trying out some new things. First new activity: yoga. I will admit that I am just a little jealous of those super flexible, lean women who look like yoga goddesses. I don't see myself as ever being "that woman" but I am really intrigued by yoga. I've tested it out a bit and my conclusion: it's tough! I think it's just what I need after a year of long (and dare I say tedious) workouts that turned my body into one tight, inflexible just-waiting-for-an-injury mess. I found a nice studio that is right on my way home from work. My first class is this Monday. I am nervous and excited all at once - I love feeling that way. I'm also thinking about jumping back into a Team in Training event. A wonderful group of people from Richmond and Blacksburg are heading to Hershey, PA in May for the Tour de Chocolate. I know, I know - it's a perfect event for me on so many levels. I can get reacquainted with my beloved road bike (she was so neglected last year), raise money to fight stupid cancer, hang out with some of my favorite cyclists....and eat chocolate. I think it's a "yes" on that one. I wish I'd said that..